Many of the scientists and analysts who are working together to add up climate change mitigation pledges to determine their sufficiency to address climate change met to collaborate at the recent UNFCCC meeting in Bonn. Scroll down to other blog posts to hear about substantive results from this meeting hosted by the European Climate Foundation. The news here is the great picture of the historic gathering from one of our hosts, Kilaparti Ramakrishna of UNEP. 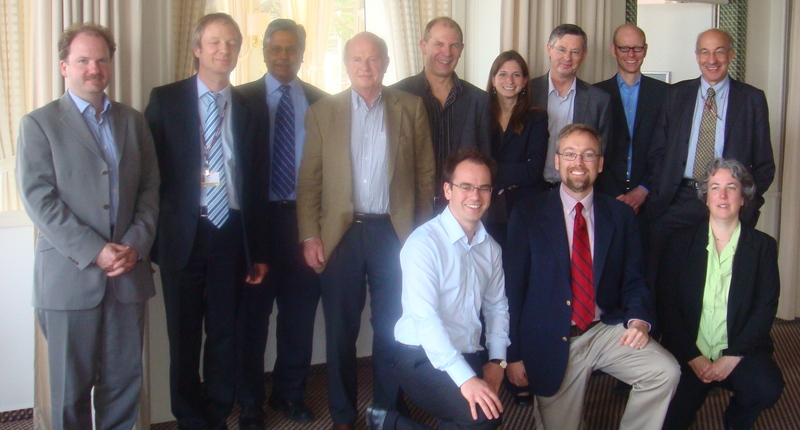 In the back row: Fabian Wagner (IIASA), Joerg Haas, (European Climate Foundation, ECF), Kilaparti Ramakrishna (UNEP), Bert Metz (ECF), Richard Folland (Climate Strategies), Kelly Levin (WRI), Murray Ward (CS), Niklas Hohne (EcoFys), Bill Hare (PIK). Front row: Ramzi Elias (ECF), Andrew Jones (SI, Climate Interactive), Beth Sawin (SI, CI). Missing: Nikola Franke (ECF).